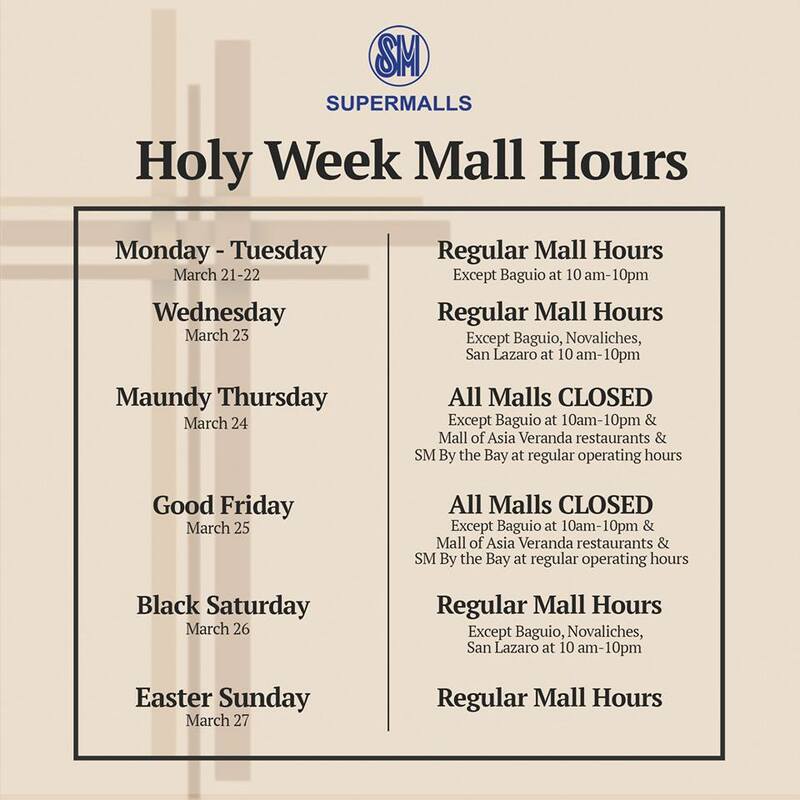 MANILA, Philippines - (Updated March 24, 2016) The country's leading shopping mall SM Supermalls and other major malls in the country officially released their business hours schedule for March 21-27 for the Holy Week 2016 observance. Check out the list of their given schedule from Holy Monday to Easter Sunday: SM Supermalls, Ayala Malls (Greenbelt, Glorietta, Trinoma, ATC, Abreeza), Powerplant, Market! Market!, Greenhills Shopping Center, Robinsons Malls, Ever Gotesco, Shopwise, Eastwood and other malls. Majority of the malls are closed for two (2) days for the Maundy Thursday and Good Friday (March 24-25). Regular mall hours are back on Black Saturday (March 26). 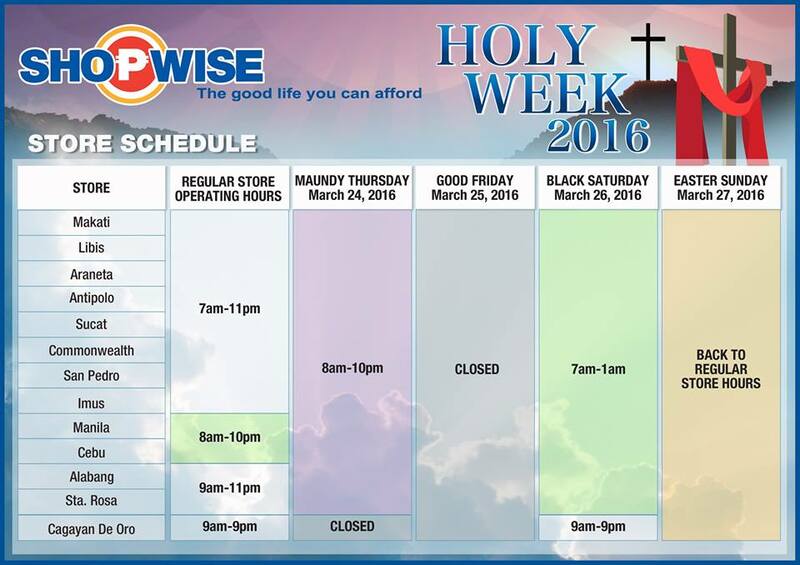 SM Supermalls on their Facebook page posted the detailed schedule for Holy Week 2016 operations. On Thursday and Friday, all malls will be closed except SM City Baguio at 10am-10pm and Mall of Asia Veranda restaurants and SM By the Bay at regular operating hours. Regular mall hours on Saturday except for Baguio, Novaliches and San Lazaro branches at 10am-10pm. 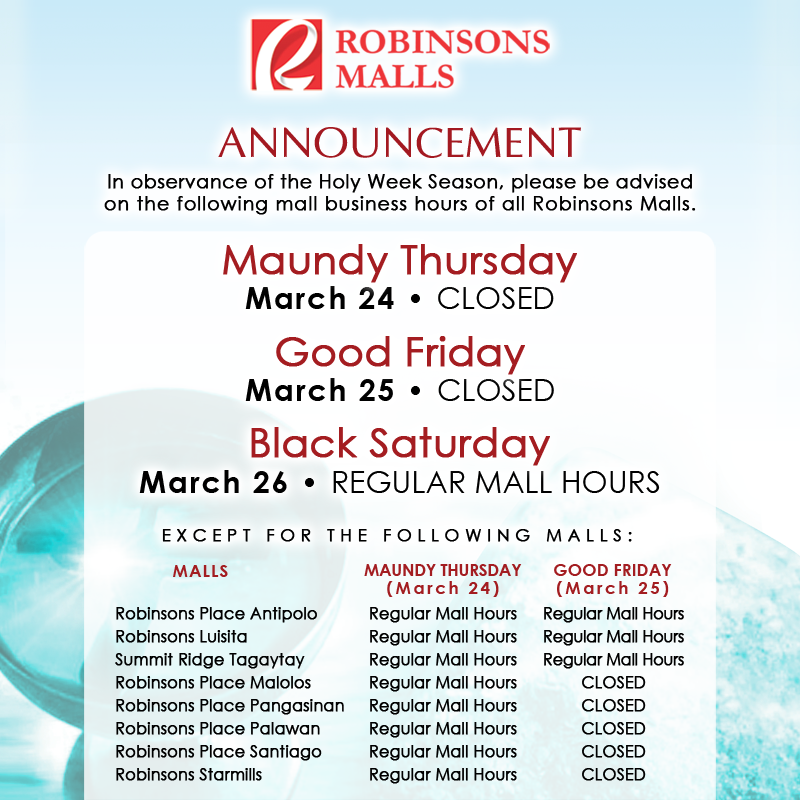 Robinson's Mall also released nationwide mall schedule through their Facebook page. All branches are closed on Maundy Thursday (March 24) except the following: Robinsons Place Antipolo, Robinsons Place Luisita, Summit Ridge Tagaytay, Robinsons Place Malolos, Robinsons Place Pangasinan, Robinsons Place Palawan, Robinsons Place Santiago and Robinsons Starmills. Meanwhile, Robinsons Place Antipolo, Robinsons Place Luisita, Summit Ridge Tagaytay are the only open branches on Good Friday (March 25). 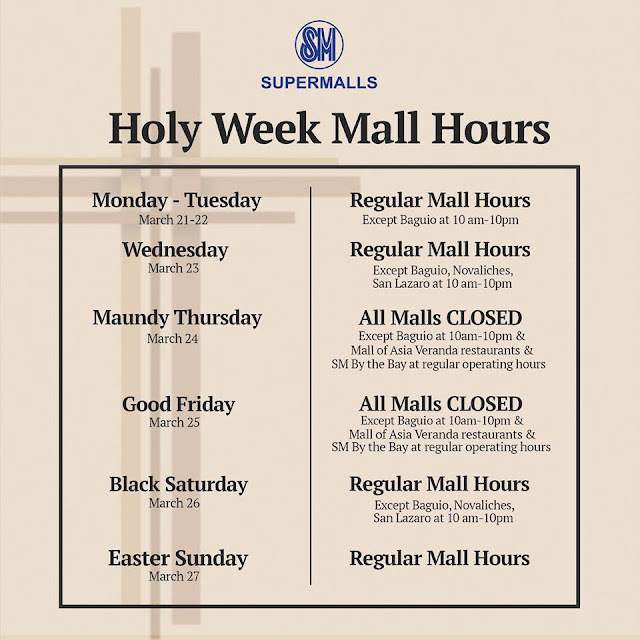 March 21-22 (Holy Monday and Tuesday): Regular mall hours except Baguio at 10 a.m. to 10 p.m.
March 23 (Holy Wednesday): Regular mall hours except Baguio, Novaliches and San Lazaro at 10 a.m. to 10 p.m.
March 26 (Black Saturday): Regular mall hours except Baguio, Novaliches and San Lazaro at 10 a.m. to 10 p.m.
March 21-23: 10 a.m. to 9 p.m.
March 26-27: 10 a.m. to 10 p.m.
March 21-23: 11 a.m. to 9 p.m.
March 26-27: 10 a.m. to 9 p.m.
March 20: 10 a.m. to 9 p.m.
March 24: 10 a.m. to 8:30 p.m.
March 26-27: 10 a.m. to 8:30 p.m.
March 24: 9:30 a.m. to 8 p.m.
March 26-27: 9:30 a.m. to 8 p.m.
March 26: 12 nn to 9 p.m.
March 27: 10 a.m. to 8 p.m.
March 26: 12 nn to 10 p.m.
March 27: 10 a.m. to 9 p.m.
March 21-24: 10 a.m. to 9 p.m.
March 26: 10 a.m. to 10 p.m.
March 23: 11 a.m. to 11 p.m.
March 26: 11 a.m. to 11 p.m.
March 27: 11 a.m. to 11 p.m.
March 24: 10 a.m. to 9 p.m.
March 26: 10 a.m. to 9 p.m.
March 24: 10 am to 9 p.m. Follow Us on Twitter or Like Us on Facebook to receive more useful updates. You may also subscribe to our RSS Feeds.